What’s the difference between acoustic violins and electric ones? Although electric violins are less popular than electric guitars and have only hit the market around the 1950s, they still offer a creative way to experiment with new music genres and styles and play around with notes to achieve new and fun sounds. Most functions of the electric guitars, including delays, distortion, looping or wah are also available for electric violins, so this type of instrument can be easily picked up by those with music skills. 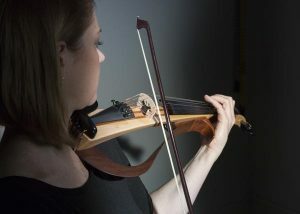 So, if you’ve decided to purchase an electric violin but you’re not quite sure which brand or model to pick, here are several features that might come in handy. The most significant difference between these two instruments is the sound. Normal violins or acoustic ones get their sound from the resonant wooden body, while electric violins come with pickups, meaning you’ll have to use an amplifier to reach the desired sound and volume. Moreover, electric violins are made of harder materials, come with solid bodies, and they often lack the cavity. As a result, the created sound doesn’t depend on the type of wood used or its density. Each acoustic violin creates a unique sound that not only depends on the technique used to manufacture it, but also on the type of wood, and the craftsmanship of the builder. Sometimes, even the same luthier can create violins that sound differently. Unlike acoustic violins, electric instruments are more consistent in terms of sound. Brands and models don’t differ too much either, so choosing the right product depends more on your requirements and how the instrument feels in your hands. Unlike other musical instruments that come with a fixed number of strings, electric violins have more versatility. Most models feature five strings, but you can also find instruments with six or even seven strings. Obviously, the number of strings will influence the quality and the complexity of the sound, helping you create unique music and play with various genres. The violin’s pickup will impact the sound quality. Some of the pickups are embedded in the bridge, while you can find others between the face of the instrument and the bridge. Some brands, like Barbera, even provide products that can be used for acoustic violins as well. If you are willing to spend some money on a good electric violin, you can even find one that allows you to control and adjust the tone and the volume. However, make sure to test these controls on your own and see if they are a good fit for you. Some of these controls may have an inconvenient location that will get in your way when you play or are hard to reach. Some electric violins, including various models from the Yamaha brand, come with a built-in headphone amplifier, allowing you to play without making too much noise. This feature is extremely useful when you want to practice in the comfort of your own home, basement or garage, without waking up the entire neighborhood. In addition, it will give you a more accurate sound and help you focus on the things that need to be improved in your playing skills. Unlike acoustic violins that come in similar sizes, electric instruments can take many shapes and dimensions, making it harder to adjust to them at the beginning. 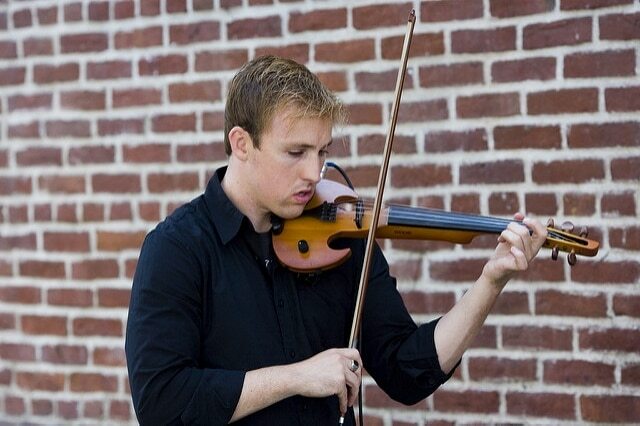 If your instrument isn’t the “traditional” violin size, you should choose a shoulder rest or a chin rest that will help you stay more comfortable. These accessories are mandatory to reduce fatigue and help you focus on your playing skills, especially if you plan on practicing for hours. Keep in mind that an uncomfortable position can lead to pains and increased anxiety that will affect your performances. Since the sound quality varies dramatically depending on the type of wood used for acoustic violins, it comes as no surprise that some of the most famous instruments, the Stradivarius violins, are sold for millions of dollars. 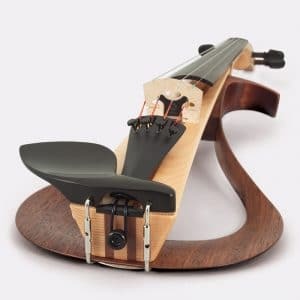 Unlike them, an electric violin for beginners shouldn’t cost more than a couple of hundreds, while a professional one will retail for up to five thousand dollars. That being said, finding a violin that fits your budget shouldn’t be too much of a struggle, especially since there are countless brands and options to choose from on the market. However, when establishing the budget for your electric violin, don’t forget to also leave room for a good amplifier, a multi-effect processor or other accessories, including a digital violin tuner. Therefore, if you don’t want to break your piggy bank, it is better to invest in high-quality accessories as these will elevate the sound of an electric violin. If you can afford to spend more than a thousand dollars on such an instrument, your options are unlimited. Most products retailed for this kind of money are handcrafted and provide an extended range of design components and features that can truly help you achieve a unique sound and play with various music genres. Some of the brands you should check out include Jordan Violin, Vector Musical Instruments, and the reputed Japanese brand, Yamaha. Last but not least, you should also consider the looks of your brand new instrument. Electric violins are available in a wide variety of shapes, sizes, designs, colors, and finishes, so why stick to a traditional look when you have the possibility to truly express your personality? You can even have a personalized item delivered in the finishes and colors of your choice if you are willing to pay extra and you find a reliable model with excellent characteristics. So why not make things more fun and interesting and choose an item that really represents you?